Book your Pacific Halibut charter fishing trip in advance for this years season. 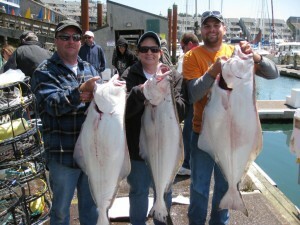 Yaquina Bay Charters offers 12 hour halibut charters or until limits are taken. The Crackerjack and Gracie K are 43 feet long and will accommodate up to 12 fisherman each comfortably. Go by yourself , with friends or with family. Ask about group rates. We also offer a private party charter on most trips. Each person fishing our our trip will receive their own pole. No one has to share a fishing rod. Each person gets to fish all the time, no waiting. If you fish aboard the Crackerjack or Gracie K, we will include crabbing on our Halibut trips. Anyone crabbing simply needs to purchase a crabbing license. * weather permitting of course. Halibut meat is a Pacific Northwest delicacy seen on most restaurant menus in the Newport area and elsewhere. While most people enjoy battered halibut and chips, it is also excellent as grilled steaks, filleted and sautéed or smoked. Description: Halibut are more elongated than most flatfish, the width about one-third the length. Both eyes are on their dark or upper side. The color on the dark side varies but tends to look like the color of the ocean bottom. The underside is white, appearing more like the sky from below. This color allows halibut to avoid detection by both prey and predator. the young halibut get pushed up to the surface and are carried to shallower waters by currents. In the shallow waters, young halibut then begin life as bottom dwellers. Most young halibut ultimately spend from five to seven years shallow nursery grounds until they reach age. Halibut live a long time, but their growth rate varies depending on habitat conditions. Female halibut grow faster and live longer than males. The oldest female caught was 42 years old and the oldest male was 27 years old. Halibut are by far largest of all flatfish. The largest ever recorded was a 495-pound fish caught near Petersburg, Alaska. Eating habits: Being very strong swimmers, halibut are able to eat a variety of fish (cod, turbot, pollock) plus some other sea creatures such as crab and shrimp. Occasionally halibut leave the ocean bottom to feed on pelagic fish such as sand lance and herring. 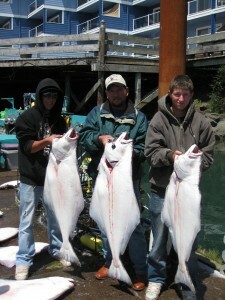 Sport fishing: Sport fishing for halibut in Oregon is very popular but regulated. Pacific halibut is managed by the United States and Canada in a bilateral commission known as the International Pacific Halibut Commission (IPHC). Each year, the IPHC sets total allowable catch levels for halibut that will be caught in the U.S. and Canadian exclusive economic zones in the northeastern Pacific Ocean. The IPHC refers to U.S. waters off the states of Washington, Oregon and California collectively as Area 2A. Regulations for Area 2A are set by NOAA Fisheries’s Northwest Regional Office. Halibut in Area 2A is divided between tribal and non-tribal fisheries, between commercial and recreational fisheries, and between recreational fisheries in different states (Washington, Oregon and California). The Pacific Fishery Management Council describes this halibut catch division each year in a catch-sharing plan.